Christ University, School of law, conducts a law entrance exam for admission to its combined 300 BA. LLB and BBA. LLB seats. The admission process has begun with the notification being in the public domain since December 8, 2017. The exam is going to be held on April 24, 2018 and the students must know what the syllabus is to start preparing full throttle. Candidates must be known about the Eligibility Criteria before starting their preparation. As ineligibility will only be led to the wastage of their precious time. The complete knowledge of syllabus is important to crack the Exam.Though the students start preparing much in advance but the syllabus is the cue to streamline preparation and gear up the speed. 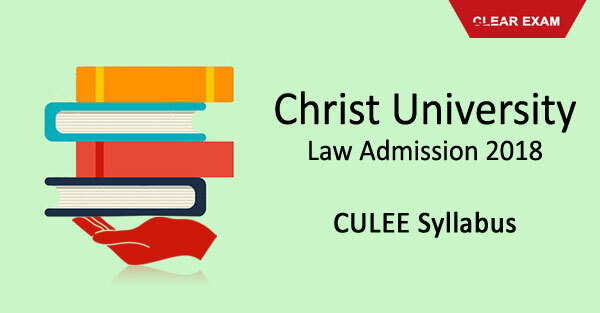 In Christ law college, only the preparations in specific will not confirm the selection, as Christ University law entrance exam also have skill assessment, micro presentation, and personal interview and it's on that basis that selection is done therefore we will also be looking at those steps. Let us start with the Christ University law entrance exam syllabus. Christ University Law Entrance Exam is scheduled to be held in coming months. Candidates must check the syllabus for CULEE 2018.